Scan and clean the Windows registry for issues and invalid entries. My Faster PC includes our own proprietary registry cleaner to help you find and repair registry issues. The Windows registry is a central repository for settings, configurations, links, and relationships for all the progams on your computer. Problems here can potentially effect the entire system, cause crashes, errors, or other problems. 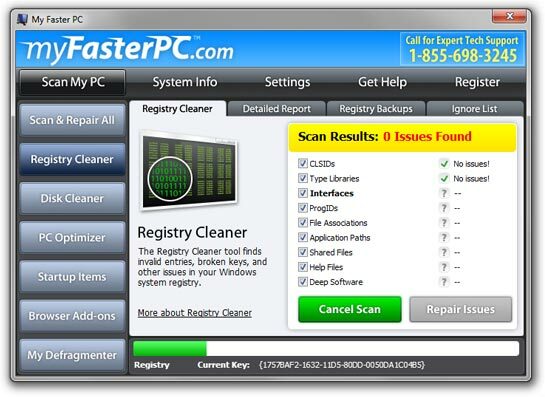 Our registry cleaner is designed to find a wide range of issues in the registry. We look for invalid entries (where programs may reference or link to items which do not exist), broken CLSIDs, empty keys, and much more. We also let you examine (and manually repair if you wish) each and every registry issue we find. Other registry cleaners rarely provide this level or transparency and may even find false positives, which are not indicative of a real problem. For older systems, cleaning the registry was very important for system stability and performance. While this is not as important for modern operating systems like Windows 7, it can still be beneficiary to periodically clean the registry and remove unneeded and invalid entries. CLSIDs: These shared objects are used by different programs on your system to provide functionality. The Registry Cleaner verifies that each object is still valid and working. Invalid or nonexistent CLSIDs can be an unnecessary burden on your system when it's attempting to find other valid objects. Type Libraries: These libaries contain commands and definitions used interact with objects, programs and DLL files. The Registry Cleaner tests the validity of these references. Often orphaned by uninstalled programs, old and invalid type libraries also burn extra system time when searching for valid type libraries. Interfaces: These are the access point between programs and CLSIDs, clearing out invalid Interfaces can save your system valuable sorting time as there can be tens of thousands on a single machine. ProgIDs: These are references used by File Associations and Type Libraries. Invalid ProgIDs can cause system errors and unusual behavior. File Associations: Methods by which Windows recognizes particular file types, such as pictures, movie files, or documents. Invalid File Associations can cause errors when Windows attempts to use a wrong or nonexistent program to access the file. Application Paths: These paths are references that allow you to launch programs using the reference name. Invalid Application Paths can cause system errors when access is attempted. Shared Files: All registered DLL's and system resources shared by multiple programs are indexed in Shared Files. If a DLL or resources does not exist, it can result in errors if a program attempts to access it. Help Files: These legacy Help Files allow programs to link to a specific help document. If this document does not exsit or is missing, an error can result. Deep Software: The Deep Software scan probes various configuration settings and file references left different programs installed on your system. Unused values and keys bloat the registry which can slow down Windows when accessing the valid software registry keys. *Free trial of My Faster PC will repair 20 errors and run PC Optimizer and My Defragmenter. Speed improvements vary based on your system configuration. ¹Tucows logo is a registered trademarks of its respective holder and is not affiliated with ConsumerSoft. Download count and ratings based on manufacturer data. Windows and the Windows logo are trademarks of the Microsoft group of companies.